Olympique Marseille defender, Patrice Evra will not play football for the rest of the season after he was handed a season-long ban by UEFA. The left back was shown a red card even before kickoff in Marseille’s November 2 Europa League match at Portugal’s Vitoria Guimaraes, where he had been named as a substitute. 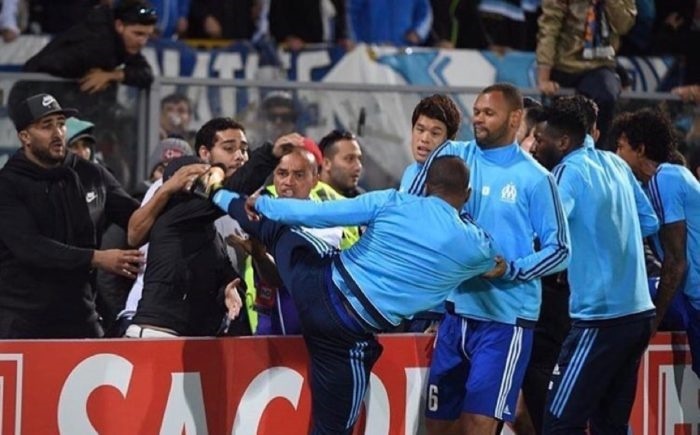 The dismissal happened after he appeared to aim a Kung-fu kick at a fan at pitch-side during warm-up. Evra is also leaving his French Ligue 1 club by mutual consent as his career looks set for an ignominious end. “He has done something irreparable by reacting to shameful provocations from a few individuals,” Marseille said in a statement. While in Manchester United, Evra won the UEFA Champions League in 2008.